The Ultimate Fighter: at the UFC TUF Gym on July 15, 2017 in Las Vegas, Nevada. 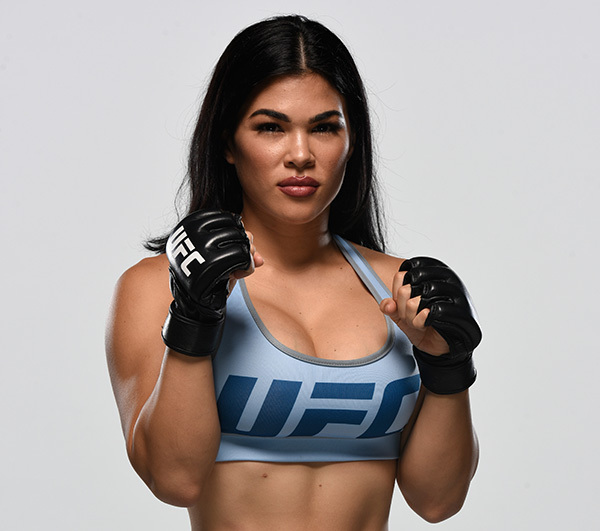 (Photo by Brandon Magnus/Zuffa LLC)" align="center" />As the daughter of Bob Ostovich, a pro fighter who fought the likes of Bobby Southworth, Andy Wang, Thomas Denny and Jason Von Flue over the course of an eight-year career, Rachael Ostovich-Berdon might have been a natural to follow her dad into the world of MMA. But the Waianae had a different first love when it came to athletics. Today, the 26-year-old is a flyweight prospect with a 3-3 pro record and the opportunity to add the phrase “world champion” to her resume if she can get through the toughest tournament in sports on season 26 of The Ultimate Fighter. This Wednesday, Ostovich competes for a spot in the quarterfinals against Hungary’s Melinda Fabian, and it’s just the latest chapter in a long, strange trip to get to this point. But maybe it was all destiny, not just with Ostovich being the daughter of a fighter, but as a native of Hawaii, a place where the fighting culture is embraced by its residents. “In Hawaii, we’re warriors and I feel like that fighting spirit was automatically in me,” she said. “There’s definitely a fighter inside of me and I’ve been a fighter since I was born. I think you can see that in my fights. Even when I have really tough times, I’m always fighting and always trying to win and get out of those tough situations. Maybe those kids just didn’t want to scrap with Bob Ostovich’s kid. Her personality bears that out, as Ostovich is as affable as they come in the fight game, a game that she was around for as long as she can remember. And that love for the sport as a lifestyle has been passed down, as Ostovich conducts this interview while bringing her four-year-old daughter to the gym with her. I wonder how mom would react if her daughter wanted to be an MMA fighter one day. That’s exactly what Ostovich is doing right now. Finally in a place in her career where she feels she can break the pattern of fighting just once a year, she’s ready to make a run at the top – for herself, her family, and her island.